Zambeza doesn’t just bring us the super potent Amnesia Haze in an easy to grow autoflower. They gave the original Amnesia Haze their XL treatment preserving the original Amnesia Haze flavour and high and made sure that she’ll reward with some substantial yields as well. Out comes a fantastic Haze hybrid that makes for a killer smoke that really everyone can grow! Amnesia Haze XL’s genetics go back to Jamaican and South Asian landraces like that of the original Amnesia Haze, a strain who is an all-time favourite of many Haze lovers. With some ruderalis magic added and then careful selection of the best phenotypes, Zambeza managed to keep all the goodies of the legendary Amnesia Haze without any drawbacks despite her being an easy-growing autoflower. Amnesia Haze XL has a reasonably short life cycle of 70-85 days from seed to harvest. Indoors, she will normally stay below 90cm and you can expect good yields of up to 400g/m². If you grow her outdoors, she can grow as tall as 120cm with yields of up to 175g per plant. Because of her compact size, she can be an ideal sativa that you can grow if you’re looking for an unassuming plant that doesn’t catch the eye of nosy neighbours while offering the perfect yield/height ratio. Amnesia Haze wouldn’t have her legendary status if it wasn’t for her exceptional taste and high. With a measured THC content of 16%, this autoflowering variant is still well up there to deliver a very potent smoke that is energetic and euphoric, just like the original! Her uplifting effect makes Amnesia Haze XL a classic daytime smoke that you can enjoy for all sorts of activities: she’ll make you happy and will put a big smile on your face! Her great high is complemented by her equally great taste that blends fresh citrus flavours with hints of spices, making her a top smoke even for picky connoisseurs! Hazes are not necessarily the easiest strains to grow. There is always the long flowering time that can make feminized Hazes quite an exercise in patience for the grower. 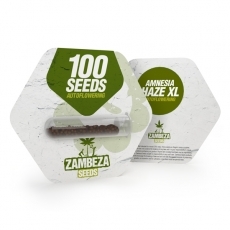 With Zambeza’s Amnesia Haze XL Auto you can now get all the goodness that we love from the original Amnesia Haze without any noteworthy drawback. This is an excellent Haze that sativa and Haze enthusiasts sure will fall in love with! Amnesia Haze XL Auto bulk seeds are available in packs of 100 seeds if you want larger quantities of this outstanding yet easy-growing Haze hybrid!